Powdery snow, the holiday season, ice skating, sledding, hot cocoa — there are a lot of things to love about winter. But for facilities managers, winter also comes with some definite downsides; cold temperatures and inclement weather can wreak havoc on facilities, stalling brand uptime and driving up costs. To minimize winter’s negative effects, FMs can turn to facilities management software. Hiring specialized, experienced contractors is absolutely essential; if a contractor doesn’t know what they’re doing, they can do more damage than good. In the winter months, this is truer than ever, since winterizing often requires specialized equipment and techniques like frozen pipe repair or ice dam removal. If contractors aren’t sure how to properly repair a broken, flooding pipe or clear a snowy roof, what was at one point a simple fix can become a major repair or liability issue – or worse. That’s why it’s important that all hired service providers are up-to-date on their insurance and in compliance with needed certifications to avoid potential legal trouble. A central aspect of facilities management software is a contractor directory. These directories provide extensive profiles of contractors, including their experience, specialties, supported trades, compliance statuses, insurance, diversity status, and reviews from previous customers. With these features, you can easily sort through contractors to find those that can address winter challenges effectively. The upswing in the amount of repair and maintenance that typically needs to be done during winter months can put a strain on facilities managers. You know that work orders can pile up in the best of times, so when trouble hits, the extra deluge of new work orders is definitely overwhelming. Using facilities management software’s work order solutions, you’re able to schedule, manage and keep a comprehensive record of all work orders throughout their life cycles. These automated processes take the day-to-day work order grind off of your hands while also reducing human error. During the winter, utilize these features to easily place service requests right when you need them, such as when it snows heavily and you need your entranceway cleared or your roof de-iced. Additionally, FM software allows you to monitor work as it’s being completed, which can be extremely helpful when you cannot be there to oversee service yourself. Finally, since FM software keeps a complete history of work orders, you can quickly and easily reference previous service requests, making reordering a breeze. Planned maintenance, or the regular upkeep work done to optimize equipment function and reduce the likelihood of complete breakdown, is an extremely effective way to stay on top of winter’s challenges. You need to think about how the winter will affect your facilities well before the cold months hit; failing to do so could result in costly equipment malfunction, poor customer experiences and reduced brand uptime. Utilize your facilities management software’s planned maintenance features to ensure your locations are ready for winter. For example, schedule annual tune-ups for hot water heaters and oil tanks leading up to winter’s arrival to reduce the probability of failure during the cold months. You should also pay special attention to preparing roofs for inclement weather, since they can cause numerous problems if not properly winterized. An added bonus of performing planned maintenance is reduced cost, since routine upkeep work is much less expensive than completely repairing or replacing failed equipment, especially at the last moment or in the middle of bad weather. Some maintenance can be planned ahead and scheduled accordingly. However, other jobs like snow plowing come at the whim of the weather, but need to be taken care of immediately. Rather than waiting for FMs or location managers to put in a formal request to plow a location’s parking lot (which could be in the middle of the night and thus delayed), some companies let their trusted contractors take advantage of apps and begin work themselves. This way, when 3” of snow falls overnight, a snow plow contractor can easily create a ‘work order’ for itself and clean a parking lot, rather than waiting til the next morning when getting a formal request. With the appropriate parameters in place, companies can be ensured that such work gets done on a timely basis by their approved contractors at agreed rates, and importantly, there’s no negative customer impact. 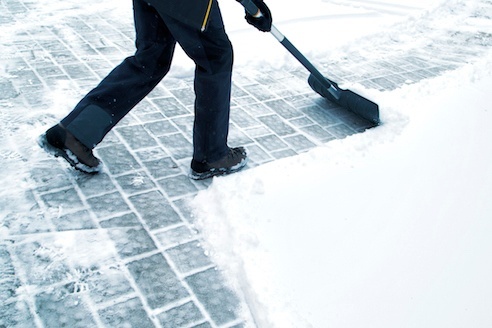 During the winter, facilities management spend tends to increase, with snow removal work orders being a major contributor. Winter FM spend can be unpredictable, as it is affected by factors like snowfall and temperature, which change from year to year. Keeping on top of spend is extremely important for planning budgets and for ensuring your yearly business outcomes do not suffer due to the winter months. Analytics is a central feature of facilities management software, combing both legacy and new FM data to generate actionable insights. FM software analytics can show facilities managers what they’ve spent on winter service in past years and help them plan for the coming year, as well as monitor current spend so adjustments can be made if need be. Winter is arguably the most challenging time of year for facilities managers; not only does the harsh weather make FM operations difficult, but it’s also a busy time for many industries, namely retail and restaurants. Holiday gifting and celebrations drive extra foot traffic to these locations, which means their bottom lines depend on optimal facility function. Don’t go into the winter months just hoping everything will be alright. A facilities management software platform can help your organization plan for and tackle winter’s toughest FM challenges. Learn more about how facilities management software can streamline and automate your business operations.